With the parliamentary process on the EU Withdrawal Bill reaching its climax, speculation has intensified over when the Article 50 TEU notification will be sent by the Prime Minister. That speculation increased when it was announced that the Prime Minister would address the Commons on the outcome of last week’s European Council on Tuesday rather than the normal Monday statement. Were the Bill to be passed on Monday, that would give Theresa May the green light to announce the triggering of Article 50. However, Downing Street has ruled out a quick triggering of Article 50. While delaying a few more weeks buys the Government time in terms of the two-year negotiation window, it would be highly desirable to avoid a clash between the notification of the UK’s withdrawal from the EU and the meeting of leaders in Rome on 25 March to commemorate 60 years of the Treaty of Rome establishing the original European Economic Community. That gathering will see EU leaders in reflective mood following not just the UK’s referendum but also the European Commission’s recently published White Paper on the Future of Europe. However, a coincidental lobbing of the Brexit grenade wouldn’t do much to get the negotiations rolling on an amicable basis while taking the fizz out of the celebratory prosecco. An editorial in The Independent counselled against an early triggering of Article 50 on the basis that to do so in the lead up to the Scottish National Party’s Spring conference might force the party’s leader and First Minister Nicola Sturgeon into calling for another independence referendum. But perhaps because the First Minister knew that this might not hinder a Prime Minister that seems intent on doing Brexit her way, and in order to avoid appearing reactive, today, Nicola Sturgeon has thrown her own political grenade by announcing that she will seek another independence referendum to be held in the Autumn of 2018. This will entail seeking an agreement with the UK government and a section 30 order to authorise the Scottish Parliament to hold such a referendum. The difficulties associated with that process have been set out by Stephen Tierney. In making her announcement, the First Minister has said that the independence referendum will offer Scottish voters a clear choice for the end of the Brexit process: between a ‘hard Brexit’ with the rest of the UK and an independent Scotland with its own relationship with the EU. However, both sides of that choice may be anything but clear. On the ‘hard Brexit’ side a great deal depends on how one defines a ‘hard Brexit’ compared to a ‘soft Brexit’. Either you start from the perspective of a single type of soft Brexit, with everything else a variation of hard Brexit (which would then give the Scottish Government a wide scope to depict a number of outcomes as ‘hard Brexit’) or you start with a single model of hard Brexit, with everything else a softening of that position. To take the former approach, one might define soft Brexit simply as an EEA-style association agreement that includes a Customs Union and Single Market participation. To take the latter approach, a ‘no deal’ scenario would be one way of conceiving of a hard Brexit. In respect of the ‘no deal’ hardest of Brexits, if the weekend papers were rife with gossip about when Article 50 might be triggered, then in more substantive terms their focus was on the report of the House of Commons Foreign Affairs Committee on what happens if there is ‘no deal’ at the end of the process. Together with submissions on behalf of the Bar Council, I gave evidence published in the report on what the risks might be in terms of non-tariff regulatory barriers and the absence of structures for administrative and regulatory cooperation. Although the Prime Minister has said that she would prefer ‘no deal’ to a bad deal, as the report highlights, the absence of a deal may be particularly bad and not simply because of the imposition of tariffs. So the penalty default of leaving the EU with nothing ought at least to suggest that the hardest of Brexits might be avoided. It just may not be the softest of Brexits in terms of an EEA-style association agreement with the EU to keep the UK in the Single Market and the Customs Union: the preferred option of the Scottish Government as set out in its December 2016 ‘Scotland’s Place in Europe’ (‘SPiE’) White Paper. The point, then, is that Scottish voters may well have different preferences as to the choice between leaving with no deal or leaving with a Deep and Comprehensive Free Trade Agreement: there are choices on the ‘hard Brexit’ side and they would need to be apparent at the point when the referendum was taking place. This may be what is driving the First Minister’s timetable in that if Michel Barnier is right that the window for negotiations is only really 18 months, by October 2018, the shape of Brexit may be much clearer. Where there is also uncertainty is on the other side of the choice: independence AND not ‘hard Brexit’. The issue of time and timing is again, crucial. An independence referendum sometime in October 2018 would likely leave only six months until the UK formally left the EU around March/April 2019. If one recalls the first independence referendum, the Scottish Government had claimed that following a vote for independence, it would conduct its independence negotiations over 18 months. At the time, this timetable was regarded as, at best, ambitious and, at worst, merely wishful thinking. But assuming the same timetable, that would mean that – as part of the UK – Scotland would be outside the EU for at least a year and if the UK left without a deal, it would be a very hard Brexit. Indeed, the harder the Brexit the more one might imagine that a vote for independence might come about in the first place. So voting for independence will not, in the short term, necessarily immunise Scotland from the effects of a hard Brexit. However, it is conceivable that the UK will exit the EU with some sort of deal and with a transitional framework pending negotiation and conclusion of a more comprehensive trade and cooperation deal. Indeed, a transitional framework might very well be useful in persuading an electorate to vote for independence with the buffer that pending that outcome, much will stay the same. Yet there are two difficulties with piggybacking on a holding-pattern UK-EU transitional framework. Firstly, it pegs the timing of independence to the length of the UK-EU transitional framework. So long as Scotland remains inside the UK following an independence vote, the transitional arrangements will apply. If it left the UK, it would have induced its own hard exit. Secondly, it simply begs the question as to what future relationship an independent Scotland would have with the EU. The ambition is likely to be ultimately for EU membership. It may be that a Scottish government might be able to use a transitional framework to negotiate its way out of the UK but it is not necessarily guaranteed that it could also use that period to negotiate its way into the EU. The synchronicity of the detachment from the UK and attachment to the EU could well be elusive. A variant of this use of a transitional framework could be to take on board the Scottish’s Government’s idea of a more differentiated Brexit. The argument for a differentiated approach had been premised on Scotland remaining part of the UK but with a different relationship with the EU. In the context of a vote for independence, the suggestion might be that Scotland and the rest of the UK would have different transitional paths in recognition of their different ultimate destinations. But in essence this would be a crypto-accession process for Scotland while it remained part of the UK and it may be hard enough to get an agreement on a transitional process for the UK as a whole without adding in another level of complexity. Another option for a Scottish Government would be to pursue a quick entry to EFTA and an early accession to the EFTA-EU EEA Agreement. Albeit falling short of a Customs Union it would give an independent Scotland a trade agreement with the four EFTA states and the trade deals negotiated by them, as well as preferential access to the EU Single Market. The question is whether it would be quicker and easier to negotiate getting into EFTA and the EEA during a transitional period when the UK has left the EU but Scotland is still inside the UK, or whether the same efforts could bring about EU membership at the end of a transitional period. Given all these uncertainties, it is unhelpful to say that the electorate in Scotland will face a choice between a hard Brexit or independence and much more will need to happen over the next 18 months to clarify what sort of Brexit the UK will get and what sort of future EU/EFTA cooperation an independent Scotland can both seek, and obtain. The fallout from the Supreme Court’s ruling in Miller keeps coming. As the previous blog discussed, parliamentarians are seeking to clothe the Government’s bare Brexit Bill – introduced to give effect to the Supreme Court’s insistence on statutory authorisation for the triggering of notice under Article 50 – with amendments intended to enhance parliamentary oversight of the withdrawal process. This week the Bill reaches its committee stage in the House of Lords, after which it will become clear what amendments, if any, will make it onto the face of the Bill and which of these, if any, will be accepted by the Government. The Article 50 Bill seeks to close the loop on what Parliament omitted to do with the European Referendum Act 2015: to equip the Government with the legal power to begin the withdrawal process. The Supreme Court accepted the argument that once this process began, the UK’s withdrawal from the EU would lead to a loss or variance of rights which had made available in domestic law through the European Communities Act 1972. As such, only Parliament had the authority to authorise a process which could lead to the loss or variance of these rights. In a recent intervention by a group of leading lawyers, including Sir David Edward (former judge of the Court of Justice), Sir Francis Jacobs (former Advocate General) and Sir Jeremy Lever – collectively the ‘Three Knights’ – it is suggested that Parliament’s involvement is not limited to the triggering of a notice of withdrawal under Article 50, paragraph 2. If, as they contend, a withdrawal decision must be taken in accordance with ‘constitutional requirements’ – the wording of Article 50, paragraph 1 – and if the UK’s constitutional requirement is for Parliament to give statutory authorisation for a loss or variance of rights, as it will not be known what rights will be lost or varied until the end of the Article 50 process, Parliament must legislate to either approve a withdrawal agreement or to allow the UK to leave without such an agreement. To put is simply, fidelity to ‘constitutional requirements’ does not begin and end with the triggering of notification; it continues through to the end of the process. The authors of this Opinion view this as the necessary implication of the Supreme Court’s ruling in Miller. There is much that may be tempting, normatively, in this enhanced level of political control over Brexit. But there are six Potential Interpretative Problems (PIPs) that emerge from the Three Knights Opinion. The words ‘constitutional requirements’ are only used in paragraph 1 of Article 50 in terms of the taking of a decision to withdraw. No further mention is made of it in respect of the notification obligation under paragraph 2, or the final withdrawal under paragraph 3. One interpretation of the Three Knights Opinion is that it assumes that the decision to withdraw has not yet been formally taken and only happens at the end of the process and so attracts the need to comply with ‘constitutional requirements’. However, as my colleague Mark Elliott has also pointed out, that would change the sequence and chronology of Article 50 from decision, notification, withdrawal to notification, decision, withdrawal. Problem 2 – Gap between Law and Politics. It is not just that the sequence of things changes, the implication is that the decision to withdraw has not yet been made legally, even though a notification of an intention to withdraw could already have been sent. While politically the decision may have been made – after all we have a minister and a government department for Exiting the European Union, – if fidelity to constitutional requirements bites when a decision is made to withdraw, it follows that this decision has not yet been made or has only been made conditionally or contingently. That may not be a problematic interpretation for lawyers but for voters and politicians, that a decision to withdraw was made in accordance with a referendum for which Parliament had enacted legislation might have been thought enough to satisfy constitutional requirements. What has always been striking about Article 50 is that it stipulates that a withdrawal agreement can be concluded, by a Qualified Majority Vote of the Member States (with the consent of the EP). Unlike other provisions of the treaty including the treaty amendment process under Article 48 TEU which expressly require domestic approval in accordance with constitutional requirement, this language is entirely – and one has to assume consciously – absent from the wording of Article 50, paragraph 3. To read across the wording of Article 50 into the ‘silence’ of paragraph 3 in the way that the Supreme Court did with regards to paragraph 2, would not only further stretch the wording and structure of Article 50, it would introduce wording that appears to have been deliberately omitted. The crux of the Opinion is the idea that it is only at the end of the process when it is clear whether the UK will have a withdrawal agreement or not and what rights will be protected or lost. As such, this is the point when the UK’s constitutional requirements bite. However, the more that this is true, the more that it undermines the very logic at the heart of Miller, namely the acceptance of Lord Pannick’s analogy that once Article 50 is triggered, the bullet hits the target and the loss or variance of rights becomes inevitable. If the Three Knights are right – and their Opinion also rests on an assumption that Article 50 notification is revocable – then it is less clear that the claimants in Miller ought to have succeeded in their Article 50 litigation. If there is a concern about what constitutional provisions ought to bite at the end of the Article 50 process, as the Three Knights Opinion makes clear, we do actually have constitutional practices which have been enshrined in legislation. The most relevant are the provisions of the Constitutional Reform and Governance Act (CRAG) 2010. This Act builds on a previous convention that the Government must lay the text of a treaty before Parliament before ratification. It acknowledges the potential risk that the Executive could enter into binding commitments under international law through treaties that Parliament could fail to give effect to in national law. Thus, Parliament is given sight of the treaty before it is ratified. Under the terms of CRAG, a resolution in either House of Parliament can delay, but only the House of Commons can block if it continually resolves that the treaty not be ratified. These domestic constitutional requirements are not, however, merely interesting examples of analogous constitutional practices that are triggered once international negotiations produce an agreement. These ARE the constitutional requirements provided by domestic law. They deliberately stop short of ceding control and power to Parliament to dictate what is or is not acceptable from the point of view of the loss or variance of domestic rights before the Government finalises its negotiations. The Executive does not negotiate according to a mandate set by Parliament. Rather Parliament exercises scrutiny over negotiations and has control before ratification. This is a question of constitutional design with which one can argue, but it is what it is: the constitutional requirements that currently apply. Article 50, paragraph 1, describes a state of affairs: the decision to withdraw from the EU. It describes a right that exists in international law. As regards the ‘constitutional requirements’ that apply to a decision, it again describes a state of affairs: it assumes that states have constitutional arrangements and that decisions are taken in accordance with them. It would be quite wrong from both a domestic and an EU law perspective to read this as prescribing particular constitutional requirements. But equally, it becomes problematic to use this description as a bootstrap for suggestions that the UK should have certain constitutional requirements in the absence of compelling domestic legal arguments explaining what these requirements are and how such requirements are triggered. What would make the Three Knights argument more compelling is actually to detach the claim for parliamentary approval from the wording of Article 50 entirely. This would rightly acknowledge that what is or is not a constitutional requirement can only be answered by the domestic legal order as indeed are the circumstances which trigger those domestic constitutional requirements. This would also avoid linking the proposal to the difficult issue of when, legally, a decision to withdraw is made. Viewed in this way, it may well be that UK constitutional law imposes constitutional requirements right across the notification, decision and withdrawal stages. But for the reasons given, it may not be possible to argue that statutory authorisation is needed at the decision stage because it undermines the argument for statutory authorisation at the notification stage. And the argument to read in constitutional requirements at the end of the process has to be reconciled with what UK law DOES already say in terms of CRAG, as much as what Article 50 DOESN’T say about adoption of a withdrawal agreement in accordance with national constitutional requirements. The Three Knights Opinion is a provocation to think about the design of constitutional requirements but as it stands the Three Knights Opinion has its PIPs. This post is based on remarks made to the Law Society, Copenhagen, Denmark 27 February 2017. The Supreme Court has decided that Parliament must provide statutory authorisation before the Prime Minister serves notice of the UK’s intention to withdraw from the European Union in terms of Article 50 TEU. A Bill – the European Union (Notification of Withdrawal) Bill – was presented to Parliament on 26th January 2017 and is due to complete its second and third readings by 8 February. Lawyers will pick over the Supreme Court’s judgment for all its constitutional nuance. And as my colleague Mark Elliott explains, there is plenty in the judgment to discuss. Yet the outcome of the judgment – in strict legal terms – was always going to be narrow and technical. Either the Government could exercise prerogative powers to give notice under Article 50 or it needed statutory authorisation. Having already been embarrassed by its lack of a plan for Brexit, the Government was now being exposed by the Supreme Court as legally naked in offering a referendum without having the legal power to act on a vote for the UK to leave the EU. Union, the United Kingdom’s intention to withdraw from the EU. Communities Act 1972 or any other enactment. So has the victory of the lead claimants in the Miller case proved somewhat hollow? In media interviews this week, Gina Miller stressed that the point of the case was to ensure Parliament played its role. Yet there appeared to be a clear distinction between, on the one hand, Parliament being asked to give formal statutory authorisation to begin the withdrawal process and, on the other hand Parliament’s role in scrutinising the negotiation and conclusion of the withdrawal agreement and any other associated agreements on the UK’s future relationship with the EU. In any case, since the referendum, both Houses of Parliament and their select committees have launched enquiry after enquiry, seeking to hold the Government to account for its Brexit strategy. Noting the power which the European Parliament has to give its consent to a withdrawal agreement under Article 50, the House of Lords European Committee has been trying to ‘bootstrap Brexit’ by demanding that the UK Parliament have at least the same level of scrutiny and oversight as that of the European Parliament. Viewed in this light, it was, perhaps, less obvious what the outcome of the Supreme Court case would add to Parliamentary oversight beyond what Parliament itself was capable of achieving. But if the Supreme Court ruling represented the law of politics, there is also a politics of law. A Bill to authorise the triggering of Article 50 was always going to bring to the fore the tension between the referendum as an exercise in direct democracy and the role of MPs in a system of representative democracy. Having provided the legal authority for a referendum, by what political authority could or should MPs collectively decide not to give the Prime Minister the authority to trigger Article 50? As a Government Bill, the Government will expect Conservative MPs to back its leader and vote to trigger Article 50. The Labour leader has given his own party a three-line whip to support the Bill, prompting one shadow Cabinet member Jo Stevens and one shadow spokesperson Tulip Siddiq to resign from the Opposition front bench. MPs from the Scottish National Party – whose MPs did not vote in favour of holding the EU referendum in the first place – will vote against the Bill. Liberal Democrat MPs have threatened to vote against the Bill unless it contains the possibility for a referendum on the final Brexit deal. Beyond the party positions, for individual MPs there is the dilemma of whether to act simply as the delegate of their constituencies – voting for or against the Bill in line with the dominant local Leave or Remain sentiments – or to act as representatives, constrained only by their conscience and the demands of party discipline. It seems likely that the Bill will be passed, but the process will expose the difficulties in reconciling the politics of the popular mandate with the politics of parliamentary democracy. But there won’t simply be a vote on the Bill as presented to Parliament. Already amendments have been tabled seeking, amongst other things, to give Parliament the power to approve any withdrawal and future cooperation agreements; to put the role of the Joint Ministerial Committee – the forum for the representation of the interests of the devolved governments – on a statutory footing; and to suspend the coming into effect of the Act unless both Houses of Parliament have approved the Brexit White Paper which the Prime Minister has promised to place before Parliament. And so, the political parties, MPs and the Lords will clothe the Article 50 Bill with a range of amendments which the Government will seek to remove. If we thought that the Brexit negotiations were going to be like a game of cards, we probably didn’t imagine it would be an exercise in Strip Poker. The year began with the outgoing UK Ambassador to the UK complaining that we didn’t yet know the UK Government’s negotiating objectives for Brexit. In her speech at Lancaster House in London on 17th January, the British Prime Minister Theresa May has given some stronger indications of her government’s direction of travel for the UK’s future relationship with the European Union. The headline political message is that the UK will be outside the Single Market. In more formal legal terms, what this means is that the UK will not seek any type of association agreement with the EU. This will disappoint those, like Andrew Duff, for whom such an arrangement offered the softest of Brexit landings. Association agreements can be concluded between the EU and a non-Member State or an international organisation. The EU has a large number of these agreements including with countries in the EU’s Mediterranean near-neighbourhood like Israel, Morocco and Tunisia. In June 2014, the EU agreed an association agreement with Ukraine, including an extensive free trade agreement together with structures for policy and political cooperation beyond trade. The difficulty with association agreements is that they require the unanimous consent of all EU Member States’ governments for signature, and can only formally enter into force once ratified in all Member States according to their own constitutional requirements. In the Netherlands, a citizen-initiated referendum – a result of the Dutch Advisory Referendum Act 2015 – put to voters the question of whether they were for, or against, the adoption of the Approval Act that would ratify the Ukraine agreement. On 6 April 2016, the electorate rejected the deal (albeit on a low turnout). This was only the second referendum to be held in the Netherlands on EU issues and, like the first – the referendum on the Constitutional Treaty held in June 2005 – it saw the rejection of what was on offer. So from a legal point of view, embarking on an association agreement would entail certain risks of delay or even failure and so create the kind of uncertainty that the Prime Minister made clear – as one of her twelve objectives for Brexit – had to be avoided. The other obvious association agreement model is that which the European Free Trade Association has with the EU in the form of the European Economic Area agreement (Switzerland does not participate but has its own series of bilateral agreements with the EU). It became clear following the referendum that the EEA model – sometimes known rather reductively as the ‘Norway’ model was a potentially attractive option, whether as the end result or even as a transitional step to allow the UK to weather the ‘Brexit Storm’. The EEA agreement entails the four freedoms that underpin the Single Market, but does not include a Customs Union – so EFTA states are free to pursue other trade agreements (EFTA currently has 27 free trade agreements). Participating EFTA states also have access to the EU’s research programmes like Horizon 2020 that allows for pan-European research collaboration and researcher mobility. But this level of engagement requires contributions to be paid with Norway making annual contributions of over €800 million. The combination of free movement of workers and contributions to the EU effectively ruled this option out for the UK government. After all – and a point repeated by Donald Tusk in a tweet response to the PM’s speech – the Single Market was regarded by EU leaders as ‘indivisible’ such that the UK could not cherry-pick which bits it did or did not want. Instead what is on the cards is a comprehensive free trade agreement. And despite the much-repeated phrase of a ‘Bespoke Brexit’ it is much more likely to be a Canada Copy. The Canada-EU agreement (CETA) is a very extensive free trade agreement. So extensive it was treated as a ‘mixed’ agreement because it was considered to stray beyond matters within the exclusive competence of the EU under the Common Commercial Policy (CCP). The precise scope of the CCP has been a matter of legal debate. But rightly or wrongly as a matter of political practice it was conceded by the European Commission that CETA was a mixed agreement and so required not just signature by Member State governments but also domestic ratification (much like association agreements). It will be recalled that there was a hiatus when the Belgian Walloon Parliament initially withheld its consent, raising concerns about the protection of labour and environmental standards as well as the novel dispute-resolution mechanism contained in the agreement. Legal challenges were also brought before the German Constitutional Court in a failed bit to halt German approval of the provisional application of the CETA agreement. In an Opinion given in late December 2016, Advocate General Sharpston offered the European Court of Justice her view of the scope of the EU’s exclusive competence under the Common Commercial Policy. If accepted, it will give a relatively wide scope to that exclusive competence – trade in goods, trade and investment in renewable energy, trade in services and government procurement (excluding certain transport services), foreign direct investment, commercial aspects of intellectual property rights, competition law, trade in road and rail transport services to name some of the key areas. This would give Theresa May’s government a useful template as to how ambitious a free trade agreement could be and still fall within the scope of the EU’s exclusive commercial policy competence and so avoid some of the pitfalls and risks of domestic ratification. None of which, of course, resolves the fundamental issue of whether the free trade agreement can be negotiated in parallel with the withdrawal agreement or whether it necessarily has to follow Brexit, when the UK will become a non-Member State. There will not, in my view, be a single Brexit agreement but rather a bundle of agreements and the next stage of clarification that is required is around the structure and sequencing of that bundle of agreements. But if the approach which the British Prime Minister has set out is guided by certain legal considerations, it is at heart an attempt to translate the reasons behind the referendum result into a political programme for Brexit. The referendum was not a general election. It did not elect a political party into power to deliver Brexit based on an election manifesto. UKIP wasn’t even directly linked to the lead campaign for Leave but was instead linked to other organisations including Leave.EU. The lead campaign was run by an organisation, Vote Leave. While some of the politicians associated with that campaign are now in government, Vote Leave has absolutely no responsibility for what will now happen. Indeed, one of the more dubious responses to the referendum result has been the Vote Leave Watch campaign which attempts to hold Vote Leave to account for promises made during the campaign. It is the government that needs to be held to account. The normal way in which a government is held to account is through the election process and through parliamentary oversight. Although parties are not bound by their election manifestos in any legal sense, they are judged on them politically. David Cameron won the 2015 general election with a Conservative Manifesto that promised to ‘safeguard British interests in the Single Market’ and to ‘extend the Single Market to new areas like digital’, concluding that ‘we say: Yes to the Single Market’. A Conservative government under a new leader – and without a general election – is now saying ‘No’ to the Single Market. The UK government’s direction of travel will also put the UK and Scottish Governments on a collision course. On 20 December 2016, the Scottish Government published its plans for ‘Scotland’s Place in Europe’. Its priorities are continuing UK participation in the Single Market – through the EEA – and the Customs Union. If that objective could not be obtained for the UK, then it proposed that a deal should be sought that would allow Scotland to participate in the EEA (it being accepted that the whole of the UK had to be either in or out of the Customs Union). Not only did Theresa May make clear that the UK was leaving the Single Market and the Customs Union, she also wants to ‘Strengthen the Union’ with a plea ‘to face the future together’ and, more pointedly, the demand that ‘no new barriers to living and doing business within our own Union are created’. The Scottish Government’s plan is being discussed at the Joint Ministerial Committee (EU Negotiations) – the forum being used by the UK Government for formal talks with the devolved administrations – on 19th January but it is difficult to imagine circumstances in which Theresa May’s government will seek to carve out a special deal for Scotland. The Prime Minister’s speech is a way of backing the Scottish First Minister Nicola Sturgeon into a corner to either back down on her bid for a differentiated Brexit or to come out fighting for an independent Scotland. As for parliamentary oversight, the key point in the Prime Minister’s speech is that the final agreement with the EU will be put to a vote in both House of Parliament. This is consistent with the view – and one put forward by the House of Lords EU Committee in its report on parliamentary scrutiny of Brexit – that the provisions of the Constitutional Reform and Governance Act 2010 would be triggered by a withdrawal agreement. But aside from the legalities, there are good reasons for the Government to engage with Parliament. In the judgment to be delivered by the Supreme Court on 24th January, we will learn whether Parliament needs to give statutory authorization for Article 50 to be triggered. While much attention will be paid to the Supreme Court’s reasoning, in the end, the outcome is binary: either a statute is needed or it is not. If it is required, then Parliament will need to legislate to begin the withdrawal process. The political parties appear to accept that they do not have a mandate to block the legislation. The Liberal Democrats, however, may attempt to tag on a requirement for a second referendum before withdrawal takes place and any new agreement replaces the UK’s existing membership of the EU. To do so would be a mistake. It would suggest that Theresa May’s Brexit Government can only act on a direct mandate from the people through a referendum rather than being – like any government – primarily accountable to Parliament. If it is necessary to go back to the people it should be through a general election. If the Supreme Court decides that Parliament is not required to give statutory authorization, the arguments for parliamentary oversight of the Brexit negotiationsremain unchanged. Of course – and as the Prime Minister herself made clear – the UK may end up with no deal at all if something acceptable to both sides cannot be agreed. That won’t be a hard landing. It will be a crash landing. Brace, brace. The resignation of Sir Ivan Rogers as the UK’s Ambassador, or ‘Permanent Representative’, to the EU has seen the New Year begin with more fireworks than the Sydney harbour bridge. His incendiary letter of resignation highlighted not just that the government’s objectives for the negotiations that will follow the triggering of Article 50 TEU are not yet known, but equally worrying that ‘serious multilateral negotiating experience is in short supply in Whitehall’. Sir Ivan had a wealth of such experience. Aside from his knowledge of the EU as David Cameron’s Europe adviser and then Permanent Representative, Rogers had significant experience of the workings of the European Commission having been chef de cabinet to Leon Brittan as EU trade commissioner. He had also acted as Cameron’s G8 ‘sherpa’. Together with Tom Scholar – David Cameron’s Europe adviser (a position Scholar filled when Rogers vacated the position to become the UK Permanent Representative) – and Ed Llewellyn – David Cameron’s Chief of Staff and now Lord Llewellyn, UK Ambassador to France – Sir Ivan had piloted the UK’s pre-referendum negotiation of a ‘new settlement’ with the EU. The post-referendum and post-resignation chatter depicts Rogers as a gloomy ‘pessimist’, raining on the parade of those who had wanted David Cameron to demand a cap on the number of EU nationals coming to the UK, and those who now view Brexit as world of opportunity if only we’re optimistic and have self-belief. As regards the renegotiation, a cap on numbers would have required treaty change which ‘old’ Member States would not stomach as it violated a founding principle of free movement and which ‘new’ Member States would view as discriminating against their nationals (who had already been the subject of transitional post-accession labour market restrictions). Not only would a cap or even an ‘emergency brake’ on the number of EU migrants coming to the UK be a political tall order, the need for treaty change would have pushed the timescale for the referendum back. What Sir Ivan and other negotiators sought, therefore, was to achieve a ‘new settlement’ within the framework of existing treaties and feasible legislative change. In terms of the post-referendum period, the publication of Sir Ivan’s private advice to ministers that a UK-EU trade deal could take up to ten years to implement has irked those who see such statements as evidence of foot-dragging, stalling and civil service attempts to derail Brexit. Yet the advice reflects the uncertainty over how negotiations will be phased – will the divorce and future relationship be sequential or negotiated in parallel? – and the risks of veto and delay that may follow if a comprehensive agreement requires domestic ratification. The outcome of Brexit depends not on optimism or mere force of personality but certain cold, hard political and legal realities. But for Brexiteers, it seems you are either with them or against them. So much so, that it was suggested that Prime Minister Theresa May should have replaced Sir Ivan with someone who believes in Brexit. Whether or not Sir Tim Barrow – swiftly appointed by Theresa May to be the new EU Permanent Representative – is feeling Brexity is not clear. However, Nigel Farage is disappointed, having used the pretext of Sir Ivan’s resignation to demand a purge of the Foreign Office. Sir Tim is a career Foreign Office diplomat with service as Ambassador to Russia and to the Ukraine. In his letter, Sir Ivan is clear that he was due to leave office once the withdrawal negotiations were underway. While it may have made sense for a new Ambassador to be in post before Article 50 is triggered, it equally makes little sense for the incumbent to leave his post abruptly just weeks before negotiations begin unless he felt under political pressure to quit. The finger of suspicion has been pointed at the Prime Minister’s joint chiefs of staff and closest political advisers Fiona Hill and Nick Timothy. It may be, however, that it was the Prime Minister herself who lost confidence in her EU Ambassador. But the political fallout from Sir Ivan’s departure raises important questions about the politicisation of the civil service and the position of the UK Permanent Representative in the context of Brexit. Conflict between ministerial advisers and civil servants is not new. The Constitutional Reform and Governance Act 2010 put the Civil Service on a statutory footing and in so doing it also recognised in law the role not just of civil servants but also special advisers. Each is governed by a Code of Conduct with a statutory basis. While civil servants have a duty of impartiality, special advisers do not, recognising that they provide more overtly political guidance to the ministers who employ them. However, according to the Code for Special Advisers, special advisers ‘should act in a way which upholds the political impartiality of other civil servants’. It is clear, then, that those advising key ministers engaged in the Brexit process must act within the boundaries of the Code and allow the civil servants who are equally engaged in the Brexit process to provide advice with complete impartiality. Brexit is a process not a credo. It is a process that requires different strands of government to work together bound by common objectives rather than a shared belief-system. Creation of the new Department for Exiting the EU – to which the UK Permanent Representation (UKREP) in Brussels reports back – was not about grouping together like-minded Brexiteers even if it is led by a pro-Brexit minister. To work well, it needs to coordinate departments across Whitehall as well as working closely with UKREP, all under the guidance of the Prime Minister. But returning to the specific issue of the politicisation of the appointment of a new Permanent Representative, it is worth highlighting that Sir Ivan is not the only Ambassador to the EU leaving his post. The US Ambassador to the EU, Anthony Gardner will be packing his bags as the Obama administration leaves office and President Trump moves into the Oval Office. In the US, the appointment of ambassadors is an overtly political matter, and nominees are scrutinised in Senate hearings prior to their appointment. The Foreign Affairs Committee has intimated its intention to hold pre-appointment hearings for appointment of individuals from outside of the diplomatic service to senior diplomatic roles. This would clearly not apply to someone with the diplomatic background of Sir Tim Barrow. But coincidentally, on 10 January 2017, the Committee takes evidence from Lord Llewellyn on his appointment as UK Ambassador to France. Although ex post rather than ex ante his appointment, it is consistent with the idea that parliament should have oversight over the appointment of individuals who have not been public servants in the traditional sense. In the absence of a pre-appointment hearing it would seem likely that select committees will want an early opportunity to take evidence from Sir Tim Barrow. After all, committees have taken evidence from Permanent Representatives in the past and this is a proper part of parliamentary oversight of ‘those representing our national interest’. Moreover, parliamentary scrutiny would seem particularly important at a time when anyone from High Court judges to ambassadors are apparently fair game to be labelled as ‘enemies of the people’ unless they toe a particular Brexit line. Parliamentary scrutiny might help build broader public confidence and trust in those who have the difficult task of interpreting the Government’s Brexit objectives, as and when they are formulated. But before the new Permanent Representative gets his chance to appear before Parliament, we may have the opportunity to hear more from his predecessor. The Chair of the European Scrutiny Committee, Sir Bill Cash sent a letter to Sir Ivan Rogers on 15 December 2016 inviting him to appear before the Committee to explain the work of UKREP. More interestingly, on 4th January 2017, and following Sir Ivan’s resignation, Sir William wrote again to Sir Ivan to say that ‘the invitation still stands’. If the invitation is accepted, the New Year fireworks may not yet have ended. In Brexit Time, nothing, and no one, is permanent. 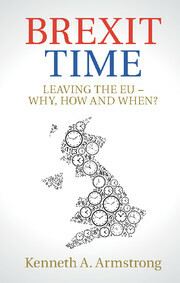 This blog was launched at the end of 2016 as a companion to my book Brexit Time and in order to provide a ‘running commentary’ on the issues surrounding the UK’s decision to withdraw from the European Union. It is time for the blog to take a new direction and to begin to think about life after Brexit. For the next three years I will be working on issues of regulatory alignment and divergence after Brexit as part of a Leverhulme Trust Major Research Fellowship. it makes sense to develop the blog to showcase that research as it emerges and to provide a forum for discussion about the impact of Brexit on the future direction of UK regulatory policy in key sectors. I hope you will continue to find the blog to be of interest and to continue to engage with the views and opinions expressed here. Brexit Time is published by Cambridge University Press. Extra Time – But for What? The Legal Clarifications to the Withdrawal Agreement – White Smoke or Smoke and Mirrors? The Cooper-Letwin Article 50 Extension Proposal – How Long For? Putting the Bullet Back in the Chamber -Could Parliament Exit from Brexit? The Brexit Effect Blog at WordPress.com.